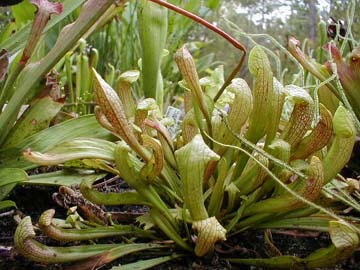 This small pitcher plant has pitchers that are recumbent, lying almost flat on the ground forming a sort of rosette. The top of the pitcher is shaped somewhat like the beak of a parrot, thus the name. With the bulbous head and recumbent pitchers that have a sort of fin, this pitcher plant looks much different from most other Sarracenias. The few I have seem to be slow growing but I’ve divided them a few times over the years. Just because it’s so different looking, it’s one of my favorites. The flowers of S. psittacina are dark red.